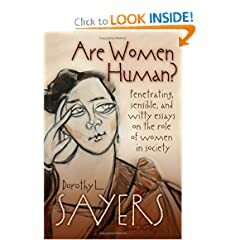 I read two books by Dorothy Sayers this past week, the mystery novel Gaudy Night, and a short book of essays called Are Women Human? I had read Gaudy Night before, in fact it was this book that first made me want to learn Latin, so I could figure out what Lord Peter Wimsey and Harriet Vane were saying to each other. The novel takes place around 1930 at a women's college in Oxford. The plot hinges on the conflict between academics and and the common man, the mind and the body, the proper place for women, and in fact, whether women are human. In Are Women Human?, Sayers examines the idea that while men are viewed as both vir and homo, women are always viewed as femina but rarely homo. (I do love the fact that Sayers doesn't hesitate to use Latin.) The essays are dated, many of Sayers' examples deal with issues that we would now view as obvious discrimination, such as news articles about whether women should wear trousers. Nonetheless, the essays are relevant, particularly when Sayers discusses grouping people into catagories, whether women, men, young, old, rich, or poor. All categories, if they are insisted upon beyond the immediate purpose which they serve, breed class antagonism and disruption in the state, and that is why they are dangerous. The idea above comes into play in the novel, and as I re-read Gaudy Night, I found many of Sayers' views espoused by the characters. Sayers' books are always many faceted and reading the essays along with the book allowed me to see how much of Sayers' beliefs found their way into the dialogue.